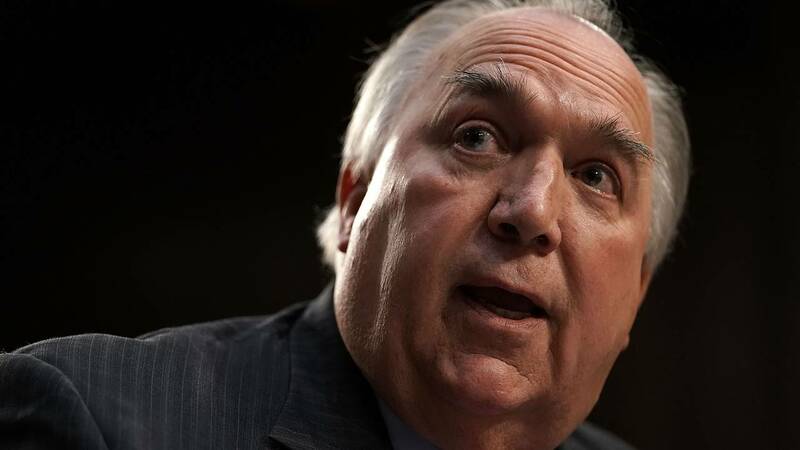 (CNN) - Michigan State University interim president John Engler resigned Wednesday after he, again, made controversial remarks about the girls and young women who were Larry Nassar's victims, the school said. The Michigan State University board of trustees intended to consider Engler's ouster Thursday but will now discuss the president's transition, university spokeswoman Emily Guerrant said. Engler, 70, announced he was stepping down in an 11-page letter to trustees, saying he was advised that several members had asked for his resignation. "When I arrived I found a university in crisis. Cascading disclosures of sexual abuse by former Michigan State University and USA Gymnastics sports doctor Larry Nassar by early 2018 had made MSU a troubled institution," he wrote. "The bottom line is that MSU is a dramatically better, stronger institution than a year ago," he wrote. His resignation comes a year and a day after the sentencing hearing began for the disgraced sports doctor. More than 150 victims testified, outlining the sexual abuse Nassar committed and the toll it took on their lives. A judge handed down a sentence of up to 175 years, telling Nassar, "I just signed your death warrant." Engler's most recent troubling remarks came last week in an interview with The Detroit News editorial board. In the final paragraph of a story about which victims the school's Healing Assistance Fund would benefit, Engler was quoted as saying there were people who were "hanging on" to the Nassar issue. "There are a lot of people who are touched by this: survivors who haven't been in the spotlight," Engler said, according to the paper. "In some ways they have been able to deal with this better than the ones who've been in the spotlight, who are still enjoying that moment at times -- you know, the awards and recognition. And it's ending. It's almost done." In a separate story, the former Michigan governor and legislator refuted an allegation made in a state attorney general's report that the university "stonewalls" investigators in the Nassar probe. Engler said he had empathy for the victims and lauded the school's efforts in sexual assault prevention and education, according to the newspaper. He went on to say he would not support any additional investigations, the paper reported. "There are some people who want to continue to investigate and inquire into lots of things," Engler said. "I wouldn't support any more. ... We're trying to get rid of lawyers and consultants now. We're trying to go back to work." Engler could not be reached for comment. An email to his office generated an automatic response. Rachael Denhollander, the first victim to accuse Nassar publicly, and her husband, Jacob, were quick to slam Engler for his comments. The 34-year-old lawyer and former gymnast noted the paradox in claiming to have empathy for victims in one breath, then saying victims are enjoying the spotlight in another. "You mean, like having to change the day I grocery shop so my 3 kids don't see a photo of their mom demonstrating what was done to her body? Tell me more about how enjoyable this spotlight is," she tweeted. Her husband accused Engler of "thumbing his nose at the board." "When you are eager to 'get back to work' and move on from the worst case of serial sexual predation of minors in decades while obstructing attempts to get to the bottom of what happened. ... Well, it tells everyone a lot about what sort of a person you are," he tweeted. "Engler must be fired." Dianne Byrum, chairwoman of the board of trustees and co-chair of the presidential search committee, tweeted Saturday that Engler was in no position to determine who the healing fund would benefit. That's a board matter, she wrote. On Wednesday, she tweeted, "There will be an MSU BOT meeting tomorrow at 8 a.m. An agenda will be posted. There will be one agenda item on personnel matters." Fellow trustee Brian Mosallam, who has been outspoken in his criticism of Engler, later quote-tweeted Byrum's post with the caption, "JOHN ENGLER'S REIGN OF TERROR IS OVER." None of the eight trustees returned CNN's calls seeking comment. Following Engler's resignation, John Manly, an attorney representing Nassar's victims, said the interim president's ouster was "long overdue" as Engler's actions had "continued to revictimize" his clients. It's sad, Manly said, that it took the spotlight comments to force his resignation. "Engler has always treated survivors as the enemy. He took actions to obstruct and undermine criminal investigations of the university and its administration by the Michigan attorney general," he said. The board of trustees first considered Engler's ouster in June after it was revealed that Engler sent an email accusing Rachael Denhollander of possibly taking payoffs to manipulate other survivors, according to The Chronicle of Higher Education, which obtained the email through an open records request. "The survivors now are being manipulated by trial lawyers who in the end will each get millions of dollars more than any of individual survivors with the exception of Denhollander who is likely to get kickback from Manly for her role in the trial lawyer manipulation," the April email said, The Chronicle reported. Engler apologized, but in comments to The Chronicle at the time, Denhollander questioned how someone with Engler's mindset could solve Michigan State's problems. It was time for Engler to go, she said. "It is out of his comprehension that someone would do something for anything other than money and power. I am not getting kickbacks, ever," she told The Chronicle. The June effort to give Engler the boot failed 6-2, with Byrum and Mosallam dissenting. "John's apology for the comments contained in an April email that was released last week is appropriate and appreciated by a majority of the Board," then-board Chairman Brian Breslin said in a statement that touted Engler's "key leadership" amid the scandal. Engler was named interim president January 30, 2018, a week after President Lou Anna Simon stepped down on the day of Nassar's sentencing, saying, "As president, it is only natural that I am the focus of this anger." Even then, Engler did not take the university's helm without controversy. Though he vowed to make sexual assault survivors the primary focus of his tenure, critics of his selection decried the lack of faculty and student input. Opponents also pointed out that, as Michigan's governor through much of the 1990s, he refused to grant US Justice Department and United Nations investigators access to the state's female prisons amid accusations that inmates were being raped and sexually abused. The board of trustees was slated to select a permanent president in June. Engler was not a candidate for the position. Though the criteria for Michigan State's next president does not mention the Nassar scandal specifically, it does say, "The president will promote a continued culture of high expectations for MSU athletic programs, with particular focus on a safe, healthy environment for athletes and others who are associated with athletic programs."